Childrens Sandboxes | Covered Sandbox Plans | Free Shipping! 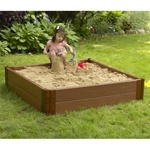 Childrens sandboxes are a great addition to any backyard. For easy construction of childrens sandboxes, consider purchasing a kit. 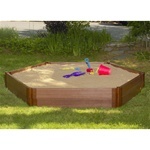 The childrens sandbox kits shown below are easy to assemble and will go together in an afternoon. Childrens sandboxes from Home Products 'n' More are a great way to surprise your kids for a birthday or any other special occasion. Free shipping on all products shown below! For more great products to enhance your yard and landscape, you've come to the right place! Home Products 'n' More is your garden and backyard headquarters. We offer a wide selections of arbors, trellises, and pergolas to grace any yard. Consider planting a climbing plant or vine such as clematis, wisteria, or trumpet vine at the base of one of our elegant vinyl arbors. The benefit to vinyl is that it's a maintenance free product. Unlike wood, there's no need to paint or stain it, and because the vinyl is treated with a UV inhibitor, it won't fade or discolor over time. Vinyl is also resistant to rotting, cracking, splintering, and checking like wood, plus it won't attract any wood boring pests. Home Products 'n' More is pleased to offer free shipping and handling on all our vinyl arbor and pergola products. For more information, go to the Patio, Lawn, & Garden category and click on Arbors, Pergolas, & Trellises. Home Products 'n' More is also please to offer a selection of outdoor furniture for your deck or patio. Choose from Adirondack chairs, loveseats, end tables, gliders, and porch swings in durable vinyl or weather resistant log cedar. Free shipping is also available on all outdoor furniture products.